The Hilti Anchor Channel system, manufactured by Hilti, recently received an evaluation report (ESR-3520) from ICC Evaluation Service (ICC-ES), providing evidence that the Hilti Anchor Channel (HAC) in combination with Hilti Channel Bolt (HBC) satisfies the requirements of the code for cast-in-place anchor systems. The report confirms compliance with 2015, 2012, 2009 and 2006 International Codes, Abu Dhabi International Building Code (ADIBC) and provides design and construction professionals with new options for building safe and code compliant structures. 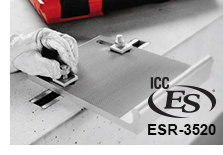 Building officials, architects, contractors, specifiers, designers and others utilize ICC-ES Evaluation Reports to provide a basis for using or approving concrete anchor systems in construction projects under the International Building Code. ICC-ES thoroughly examined product information, test reports, calculations, quality control methods and other factors to ensure that the Hilti Anchor Channel system is code-compliant. “The process of obtaining an ESR for our anchor channel system was professional and efficient. Through the support of ICC-ES staff and the updated AC232, Hilti is the first manufacturer to be able to provide guidance and solutions for anchor channel applications to engineers and installers.” said Dr. Philipp Grosser, Head of Technology and Engineering for Cast-in Systems with the Hilti Corporation in Schaan, Liechtenstein. The Hilti anchor channels (HAC) and Hilti anchor channel bolts (HBC), used in conjunction with Hilti HIT-HY 100 adhesive are used to resist static, wind, and seismic (IBC Seismic Design Categories A through F) tension loads, shear loads perpendicular to the longitudinal channel axis, shear loads acting in the direction of the longitudinal channel axis, or any combination of these loads. ESR-3520 includes design and installation instructions, conditions of use, information on required special inspections and several detailed tables and figures to assist in design, construction and code compliance verification.